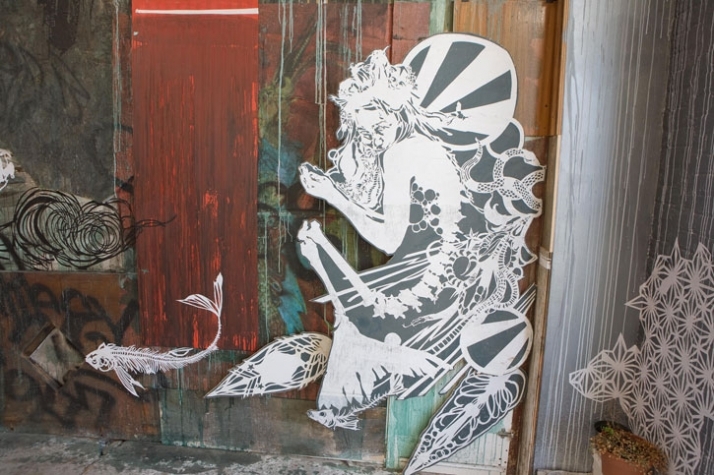 Swoon is a kind of an artistic pirate that after taking the land with her amazing paper cut-outs and realistic figures that form part of the everyday city life, she decided to take the seas as well. As a captain of her recycled dreamlike boats, she contaminates in her path all of her fellow companions with her vital energy. This Brooklyn based artist, with major works in MoMA, PS1, Tate Modern and at galleries such as Deitch Projects (NYC) and Gallerie L.J (Paris), knows like no one else to combine illustrations, performance acts and in situ installations in a joyful fiesta full of colours, eco consciousness and positivity. Currently she is sailing the Adriatic Sea from Slovenia towards to Venice, having as a goal to dock her fleet of intricately handcrafted vessels in Venice in time for the Biennale. These 3 sculptural rafts will bring music, performance, and a cabinet of wonders to Venice that will have been collected on the journey. 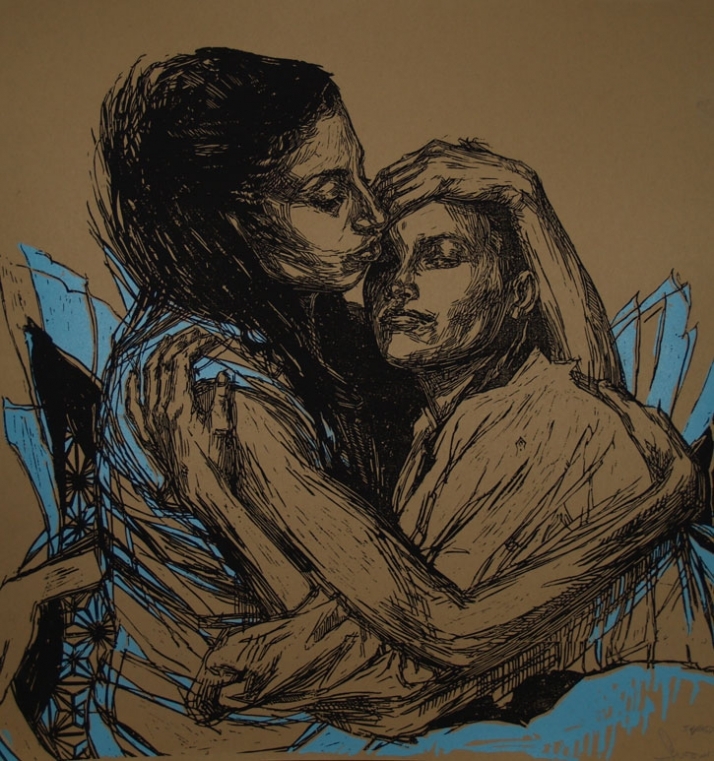 To raise money needed to make her dream come true, Swoon has been selling her work at various fundraisers and events, but the project still needs further funds. 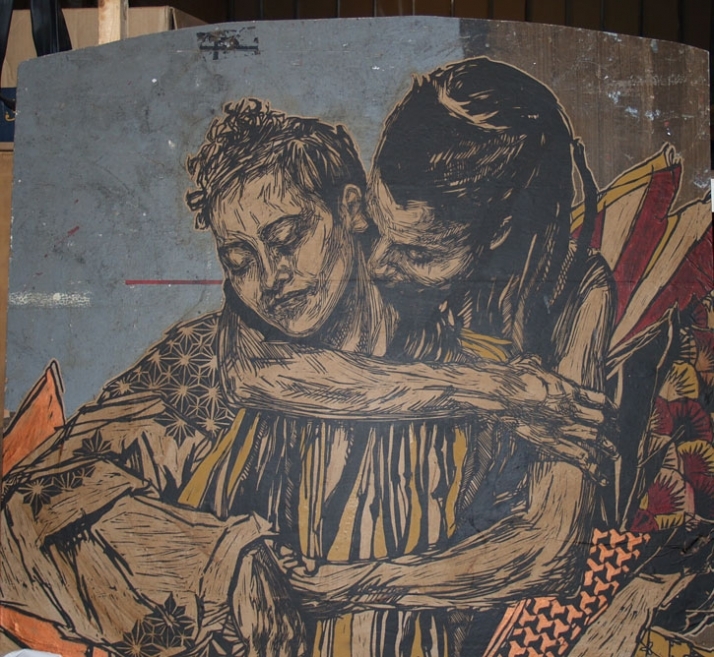 Yatzer met SWOON who gave us all the details about her latest adventures. We are proudly sharing them exclusively with all of our crew! I started in the way that I think most artists start, before you can read, or ride a bike, or even say many words, you draw and you draw and you draw. From street art to the swimming cities project there seems to be quite a distance, at least this is the first impression one might have. How did one led to another? From the street posters to the boats there is definitely a world of difference, but also a kind of a hidden thread of similarity. When I started making art outside on city streets, I was looking for a way to create art that participated in the world, that sought context within our daily lives, and that was not dependent solely upon art institutions. I had been a painter and felt that i could no longer create things that lived only in the confines of the square, the gallery, the museum, and the art market. Once I broke out just a little bit, it was like releasing the flood. One thought led to another and then another. Somewhere in there I started to find people that felt the same way and began to work collectively along side of my independent art making. Once I learned how to dream big with groups of like minded people, I found that when a group gets together and decides to make something happen, what emerges which is more than the sum of it's parts. Things which seem impossible start to become a matter of believing in them enough to figure out, piece by piece, what it takes to make them happen. It's a kind of magic which gets generated, and what you are able to believe in grows, because what you are able to do has grown. This is the place that the boat projects were born from. 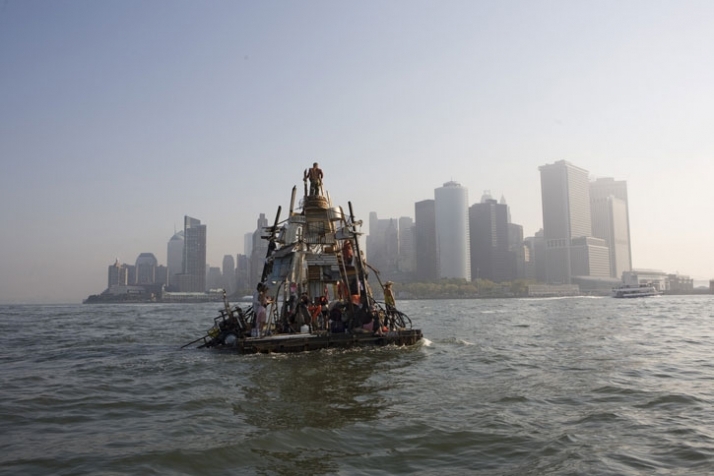 The boats that form part of the Swimming Cities of Switchback Sea project finally ended up to the Deitch gallery and formed part of an installation. 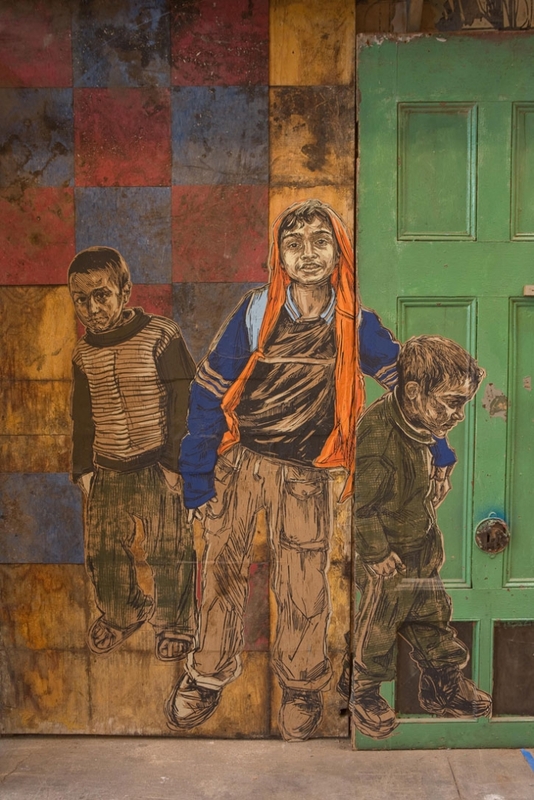 What is the difference between creating art in the streets and having an exhibition to a gallery and how did you come up with the idea to combine those two elements? Working in the streets is one of my favorite things on earth to do. The stories that emerge, the interactions that you have, the experience of becoming a part of the fabric of the city -- it's completely singular in these ways. I think it's something i will continue to do in one way or another for the rest of my life. Once I found that I could create art with or without a gallery, working in galleries became more of a choice than the forgone conclusion of all my efforts. All at once institutions didn't seem so daunting. I found that there were things I wanted to create inside a room, and that having the space to do so expanded my thinking one step further. Now I could learn to build all of the strange cities I walked around in at night in my dreams. 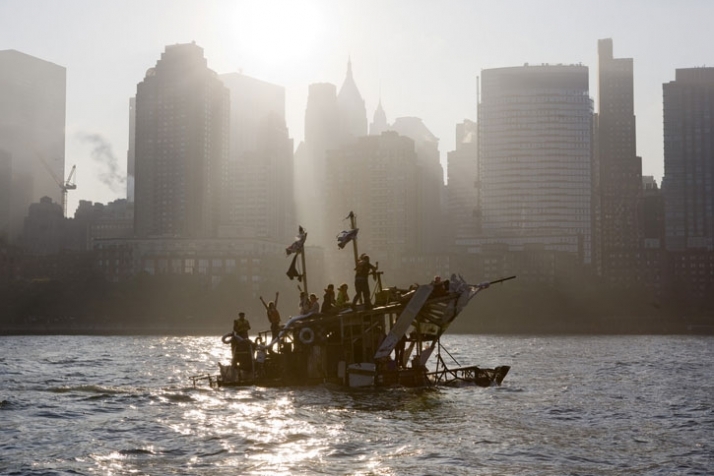 Paralleling all of this is a long series of collective projects, from Toyshop, a collective focused on street art and street events, to the Miss Rockaway Armada, a collective which rafted the Mississippi river for two summers, performing in towns along the river. 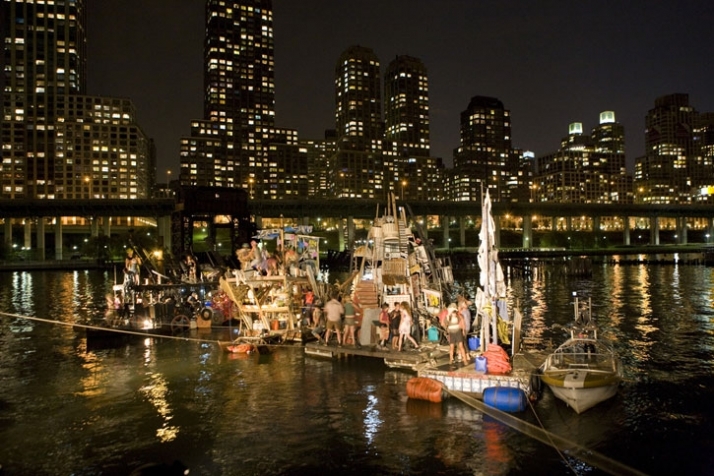 The Swimming Cities of Switchback Sea was a chance to unify all of my divergent thought processes, working on the streets while creating an emersive installation, and bringing together years of collective boat making and travels. For that reason it was the most difficult project I have ever done, and took the most out of me, but I still feel so lucky to have had the opportunity. Which is the working process that you follow? It starts with drawing. It ends up trying to build a whole world. Could you reveal us some details about the Swimming Cities trip to Venice? We're going from Ankaran Slovenia to Venice, making our way slowly along the coast and going through the littoral canals. We will be stopping in towns to play music and meet people, to collect stories and find things for a cabinet of wonders. Thus far people in Slovenia have been so warm and enthusiastic; we're all very excited about the rest of the journey. How Long will the boats be on display in Venice? In your creations recycling and eco consciousness have a prominent role. 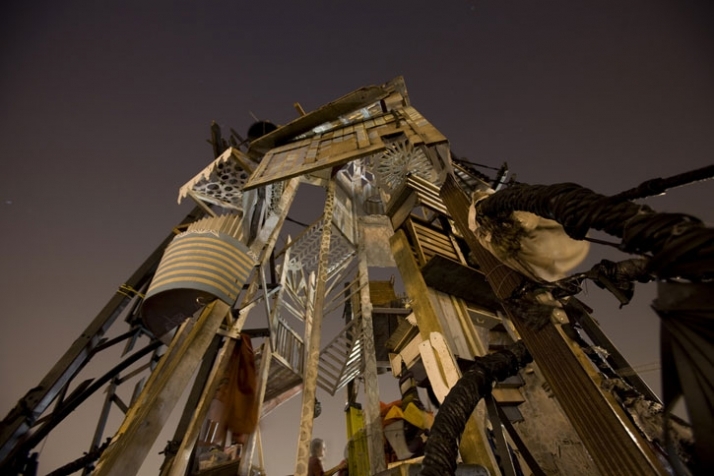 You have quoted that there is no reason to cut up a whole forest in order to make an installation and instead of this you have opted for reusing already found objects or asking people to collaborate. Does this perspective limit the things you can do or it opens previously unexplored paths? What I have tried to do is find a philosophy and an ethic of working that allows me to create the things that i'm compelled to create while seeking out a better relationship to the cycles of resource use and consumption than those that are dominant in our lifestyle. I've been far from perfect at this, but it's also been important for me not to let an unflinching adherence to a philosophy stop me from creating. For that reason I have never found this approach to be restrictive because I follow it down all of the new paths it offers, but have also done a lot of compromising with traditional systems and a lot of traveling on the main roads. In one of your interviews you commented that a dream of yours served you as a creative reference. From where else do you get inspired? Mostly I get inspired by looking. I started my life as an artist looking at art, constantly absorbing every artistic influence I could. As i became more my own person I started to look more toward the world around me for inspiration. It was as though the path beaten by the artists who came before me ended and I was on my own, and a little lost, so I just looked around me. I looked at people, and nature, and cities. Lately I'll look at a city block in a major city like Cairo or Bangkok, and try to understand the organic process by which people build the things that suit their needs. I find myself trying to imbibe the almost emergent logic of these things to the extent that I understand it as a behavior which I can emulate in other materials. And of course there are dreams, where all disbelief is suspended, and new languages get practice. Which are the main difficulties you have to face in order to realize your projects? I would say the main difficulties are logistical. It's an endeavor as involved as a film production except we don't have 3 years and a million dollars. We have a few months and the money we could scrape together throwing parties, and seeking support from our community, (both art world, and grassroots) in the middle of a recession. We're here in Slovenia where we don't speak the language and none of our tools work, and we're asking people to understand this crazy mission we're on. The amazing part is that people really do get it, and all of the thousand details that make this work are being figured out by all of us one at a time. Your latest projects seem to be the fruit of a successful interaction between various people. Furthermore, the spectator often seems to become a part of your work. How do you feel looking at all of those people that share your visions and put all of their passion and energy to your projects? I'm glad you asked this because this is one of the questions that I think about constantly these days. I'm out here in Slovenia working day and night by the Adriatic at our build site with 20 people. Every person is deeply enmeshed in this process, from the job of figuring out how to feed 20 people three times a day and where they are going to sleep, to understanding how to properly engineer structures that will withstand wind and water, to planning the performance, figuring out the route, and passing customs and the coast guard. While I instigated and conceptualized the project, I would be nowhere without all of the people who are here with me making it happen. All of them have a tremendous amount of creative input, and all of them are people who have their own projects and passions. We are a part of a larger community of artists who work collectively to make each other's visions real. The longer I think about it the more I think it is a really important phenomena that deserves a lot of attention. The myth of the single artist laboring away to make a great work that is theirs alone seems like a grotesque simplification. I get to be in the driver's seat today, but of this group, any of the people on the crew could be directing a comparable project according to their own visions, and most of them do. It's pretty amazing. 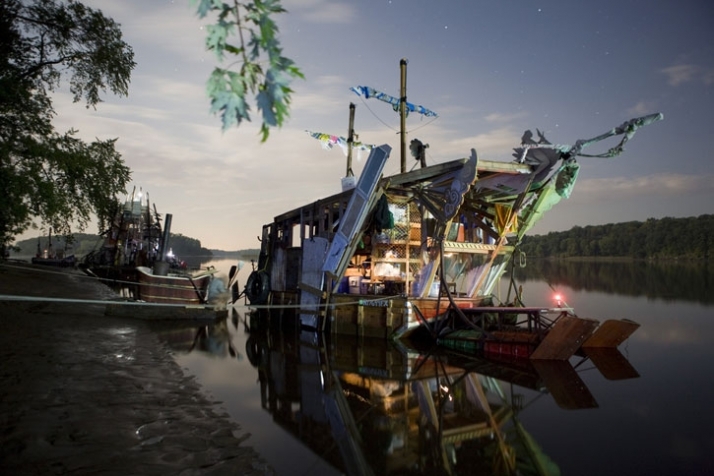 As far as the spectator participation, the first time the Miss Rockaway Armada pulled up on the banks of a town along the upper Mississippi and people started spontaneously bringing us clean socks and tomatoes from their gardens; I felt that we were doing something right. Never in New York had I ever seen this kind of basic human outpouring of kindness, support, and appreciation, and it just felt very real. I thought that if art is a way to communicate, these were the kinds of conversations I wanted to be having.